For other uses, see Ozone (disambiguation). "Oxygen 3" redirects here. For the Jean-Michel Jarre album, see Oxygène 3. 2 or dioxygen. Ozone is formed from dioxygen by the action of ultraviolet light (UV) and electrical discharges within the Earth's atmosphere. It is present in very low concentrations throughout the latter, with its highest concentration high in the ozone layer of the stratosphere, which absorbs most of the Sun's ultraviolet (UV) radiation. Ozone's odour is reminiscent of chlorine, and detectable by many people at concentrations of as little as 6993100000000000000♠0.1 ppm in air. Ozone's O3 structure was determined in 1865. The molecule was later proven to have a bent structure and to be diamagnetic. In standard conditions, ozone is a pale blue gas that condenses at progressively cryogenic temperatures to a dark blue liquid and finally a violet-black solid. Ozone's instability with regard to more common dioxygen is such that both concentrated gas and liquid ozone may decompose explosively at elevated temperatures or fast warming to the boiling point. It is therefore used commercially only in low concentrations. Ozone is a powerful oxidant (far more so than dioxygen) and has many industrial and consumer applications related to oxidation. This same high oxidising potential, however, causes ozone to damage mucous and respiratory tissues in animals, and also tissues in plants, above concentrations of about 6993100000000000000♠0.1 ppm. While this makes ozone a potent respiratory hazard and pollutant near ground level, a higher concentration in the ozone layer (from two to eight ppm) is beneficial, preventing damaging UV light from reaching the Earth's surface. The trivial name ozone is the most commonly used and preferred IUPAC name. The systematic names 2λ4-trioxidiene and catena-trioxygen, valid IUPAC names, are constructed according to the substitutive and additive nomenclatures, respectively. The name ozone derives from ozein (ὄζειν), the Greek verb for smell, referring to ozone's distinctive smell. In appropriate contexts, ozone can be viewed as trioxidane with two hydrogen atoms removed, and as such, trioxidanylidene may be used as a context-specific systematic name, according to substitutive nomenclature. By default, these names pay no regard to the radicality of the ozone molecule. In even more specific context, this can also name the non-radical singlet ground state, whereas the diradical state is named trioxidanediyl. Trioxidanediyl (or ozonide) is used, non-systematically, to refer to the substituent group (-OOO-). Care should be taken to avoid confusing the name of the group for the context-specific name for ozone given above. In 1785, the Dutch chemist Martinus van Marum was conducting experiments involving electrical sparking above water when he noticed an unusual smell, which he attributed to the electrical reactions, failing to realize that he had in fact created ozone. A half century later, Christian Friedrich Schönbein noticed the same pungent odour and recognized it as the smell often following a bolt of lightning. In 1839, he succeeded in isolating the gaseous chemical and named it "ozone", from the Greek word ozein (ὄζειν) meaning "to smell". For this reason, Schönbein is generally credited with the discovery of ozone. The formula for ozone, O3, was not determined until 1865 by Jacques-Louis Soret and confirmed by Schönbein in 1867. For much of the second half of the nineteenth century and well into the twentieth, ozone was considered a healthy component of the environment by naturalists and health-seekers. Beaumont, California had as its official slogan "Beaumont: Zone of Ozone", as evidenced on postcards and Chamber of Commerce letterhead. Naturalists working outdoors often considered the higher elevations beneficial because of their ozone content. "There is quite a different atmosphere [at higher elevation] with enough ozone to sustain the necessary energy [to work]", wrote naturalist Henry Henshaw, working in Hawaii. Seaside air was considered to be healthy because of its believed ozone content; but the smell giving rise to this belief is in fact that of halogenated seaweed metabolites. During World War I, ozone was tested at Queen Alexandra's Military Hospital in London as a possible disinfectant for wounds. The gas was applied directly to wounds for as long as 15 minutes. This resulted in damage to both bacterial cells and human tissue. Other sanitizing techniques, such as irrigation with antiseptics, were found preferable. Ozone is colourless or pale blue gas (blue when liquefied), slightly soluble in water and much more soluble in inert non-polar solvents such as carbon tetrachloride or fluorocarbons, in which it forms a blue solution. At 161 K (−112 °C; −170 °F), it condenses to form a dark blue liquid. It is dangerous to allow this liquid to warm to its boiling point, because both concentrated gaseous ozone and liquid ozone can detonate. At temperatures below 80 K (−193.2 °C; −315.7 °F), it forms a violet-black solid. Most people can detect about 0.01 μmol/mol of ozone in air where it has a very specific sharp odour somewhat resembling chlorine bleach. Exposure of 0.1 to 1 μmol/mol produces headaches, burning eyes and irritation to the respiratory passages. Even low concentrations of ozone in air are very destructive to organic materials such as latex, plastics and animal lung tissue. Ozone is diamagnetic, with all its electrons paired. In contrast, O2 is paramagnetic, containing two unpaired electrons. According to experimental evidence from microwave spectroscopy, ozone is a bent molecule, with C2v symmetry (similar to the water molecule). The O – O distances are 127.2 pm (1.272 Å). The O – O – O angle is 116.78°. The central atom is sp² hybridized with one lone pair. Ozone is a polar molecule with a dipole moment of 0.53 D. The molecule can be represented as a resonance hybrid with two contributing structures, each with a single bond on one side and double bond on the other. The arrangement possesses an overall bond order of 1.5 for both sides. Ozone is among the most powerful oxidizing agents known, far stronger than O2. It is also unstable at high concentrations, decaying into ordinary oxygen. Its half-life varies with atmospheric conditions such as temperature, humidity, and air movement. In a sealed chamber with a fan that moves the gas, ozone has a half-life of approximately one day at room temperature. Some unverified claims assert that ozone can have a half life of as short as thirty minutes under atmospheric conditions. This reaction proceeds more rapidly with increasing temperature. Deflagration of ozone can be triggered by a spark and can occur in ozone concentrations of 10 wt% or higher. Ozone can also be produced from oxygen at the anode of an electrochemical cell. This reaction can create smaller quantities of ozone for research purposes. This can be observed as an unwanted reaction in a Hoffman gas apparatus during the electrolysis of water when the voltage is set above the necessary voltage. Alkenes can be oxidatively cleaved by ozone, in a process called ozonolysis, giving alcohols, aldehydes, ketones, and carboxylic acids, depending on the second step of the workup. Ozone can also cleave alkynes to form a acid anhydride or diketone product. If the reaction is performed in the presence of water, the anhydride hydrolyzes to give two carboxylic acids. Usually ozonolysis is carried out in a solution of dichloromethane, at a temperature of −78oC. After a sequence of cleavage and rearrangement, an organic ozonide is formed. With reductive workup (e.g. zinc in acetic acid or dimethyl sulfide), ketones and aldehydes will be formed, with oxidative workup (e.g. aqueous or alcoholic hydrogen peroxide), carboxylic acids will be formed. These three reactions are central in the use of ozone based well water treatment. Ozone will also detoxify cyanides by converting them to cyanates. Ozone is a bent triatomic molecule with three vibrational modes: the symmetric stretch (1103.157 cm−1), bend (701.42 cm−1) and antisymmetric stretch (1042.096 cm−1). The symmetric stretch and bend are weak absorbers, but the antisymmetric stretch is strong and responsible for ozone being an important minor greenhouse gas. This IR band is also used to detect ambient and atmospheric ozone although UV based measurements are more common. The electronic spectrum of ozone is quite complex. An overview can be seen at the MPI Mainz UV/VIS Spectral Atlas of Gaseous Molecules of Atmospheric Interest. All of the bands are dissociative, meaning that the molecule falls apart to O + O2 after absorbing a photon. The most important absorption is the Hartley band, extending from slightly above 300 nm down to slightly above 200 nm. It is this band that is responsible for absorbing UV C in the stratosphere. On the high wavelength side, the Hartley band transitions to the so-called Huggins band, which falls off rapidly until disappearing by ~360 nm. Above 400 nm, extending well out into the NIR, are the Chappius and Wulf bands. There, unstructured absorption bands are useful for detecting high ambient concentrations of ozone, but are so weak that they do not have much practical effect. There are additional absorption bands in the far UV, which increase slowly from 200 nm down to reaching a maximum at ~120 nm. The standard way to express total ozone levels (the amount of ozone in a given vertical column) in the atmosphere is by using Dobson units. Point measurements are reported as mole fractions in nmol/mol (parts per billion, ppb) or as concentrations in μg/m3. The study of ozone concentration in the atmosphere started in the 1920s. The highest levels of ozone in the atmosphere are in the stratosphere, in a region also known as the ozone layer between about 10 km and 50 km above the surface (or between about 6 and 31 miles). However, even in this "layer", the ozone concentrations are only two to eight parts per million, so most of the oxygen there is dioxygen, O2, at about 210,000 parts per million by volume. Ozone in the stratosphere is mostly produced from short-wave ultraviolet rays between 240 and 160 nm. Oxygen starts to absorb weakly at 240 nm in the Herzberg bands, but most of the oxygen is dissociated by absorption in the strong Schumann–Runge bands between 200 and 160 nm where ozone does not absorb. While shorter wavelength light, extending to even the X-Ray limit, is energetic enough to dissociate molecular oxygen, there is relatively little of it, and, the strong solar emission at Lyman-alpha, 121 nm, falls at a point where molecular oxygen absorption is a minimum. followed by reaction of the oxygen atom with another molecule of oxygen to form ozone. An estimate of the rate of this termination step to the cycling of atomic oxygen back to ozone can be found simply by taking the ratios of the concentration of O2 to O3. The termination reaction is catalysed by the presence of certain free radicals, of which the most important are hydroxyl (OH), nitric oxide (NO) and atomic chlorine (Cl) and bromine (Br). In the second half of the 20th Century the amount of ozone in the stratosphere was discovered to be declining, mostly because of increasing concentrations of chlorofluorocarbons (CFC) and similar chlorinated and brominated organic molecules. The concern over the health effects of the decline led to the 1987 Montreal Protocol, the ban on the production of many ozone depleting chemicals and in the first and second decade of the 21st Century the beginning of the recovery of stratospheric ozone concentrations. Levels of ozone at various altitudes and blocking of different bands of ultraviolet radiation. Essentially all UVC (100–280 nm) is blocked by dioxygen (at 100–200 nm) or by ozone (at 200–280 nm) in the atmosphere. The shorter portion of this band and even more energetic UV causes the formation of the ozone layer, when single oxygen atoms produced by UV photolysis of dioxygen (below 240 nm) react with more dioxygen. The ozone layer itself then blocks most, but not quite all, sunburn-producing UVB (280–315 nm). The band of UV closest to visible light, UVA (315–400 nm), is hardly affected by ozone, and most of it reaches the ground. Ozone in the ozone layer filters out sunlight wavelengths from about 200 nm UV rays to 315 nm, with ozone peak absorption at about 250 nm. This ozone UV absorption is important to life, since it extends the absorption of UV by ordinary oxygen and nitrogen in air (which absorb all wavelengths < 200 nm) through the lower UV-C (200–280 nm) and the entire UV-B band (280–315 nm). The small unabsorbed part that remains of UV-B after passage through ozone causes sunburn in humans, and direct DNA damage in living tissues in both plants and animals. Ozone's effect on mid-range UV-B rays is illustrated by its effect on UV-B at 290 nm, which has a radiation intensity 350 million times as powerful at the top of the atmosphere as at the surface. Nevertheless, enough of UV-B radiation at similar frequency reaches the ground to cause some sunburn, and these same wavelengths are also among those responsible for the production of vitamin D in humans. The ozone layer has little effect on the longer UV wavelengths called UV-A (315–400 nm), but this radiation does not cause sunburn or direct DNA damage, and while it probably does cause long-term skin damage in certain humans, it is not as dangerous to plants and to the health of surface-dwelling organisms on Earth in general (see ultraviolet for more information on near ultraviolet). Low level ozone (or tropospheric ozone) is an atmospheric pollutant. It is not emitted directly by car engines or by industrial operations, but formed by the reaction of sunlight on air containing hydrocarbons and nitrogen oxides that react to form ozone directly at the source of the pollution or many kilometers down wind. Ozone reacts directly with some hydrocarbons such as aldehydes and thus begins their removal from the air, but the products are themselves key components of smog. Ozone photolysis by UV light leads to production of the hydroxyl radical HO• and this plays a part in the removal of hydrocarbons from the air, but is also the first step in the creation of components of smog such as peroxyacyl nitrates, which can be powerful eye irritants. The atmospheric lifetime of tropospheric ozone is about 22 days; its main removal mechanisms are being deposited to the ground, the above-mentioned reaction giving HO•, and by reactions with OH and the peroxy radical HO2•. There is evidence of significant reduction in agricultural yields because of increased ground-level ozone and pollution which interferes with photosynthesis and stunts overall growth of some plant species. The United States Environmental Protection Agency is proposing a secondary regulation to reduce crop damage, in addition to the primary regulation designed for the protection of human health. Certain examples of cities with elevated ozone readings are Houston, Texas, and Mexico City, Mexico. Houston has a reading of around 41 nmol/mol, while Mexico City is far more hazardous, with a reading of about 125 nmol/mol. Ozone gas attacks any polymer possessing olefinic or double bonds within its chain structure, such as natural rubber, nitrile rubber, and styrene-butadiene rubber. Products made using these polymers are especially susceptible to attack, which causes cracks to grow longer and deeper with time, the rate of crack growth depending on the load carried by the rubber component and the concentration of ozone in the atmosphere. Such materials can be protected by adding antiozonants, such as waxes, which bond to the surface to create a protective film or blend with the material and provide long term protection. Ozone cracking used to be a serious problem in car tires for example, but the problem is now seen only in very old tires. On the other hand, many critical products, like gaskets and O-rings, may be attacked by ozone produced within compressed air systems. Fuel lines made of reinforced rubber are also susceptible to attack, especially within the engine compartment, where some ozone is produced by electrical components. Storing rubber products in close proximity to a DC electric motor can accelerate ozone cracking. The commutator of the motor generates sparks which in turn produce ozone. Although ozone was present at ground level before the Industrial Revolution, peak concentrations are now far higher than the pre-industrial levels, and even background concentrations well away from sources of pollution are substantially higher. Ozone acts as a greenhouse gas, absorbing some of the infrared energy emitted by the earth. Quantifying the greenhouse gas potency of ozone is difficult because it is not present in uniform concentrations across the globe. However, the most widely accepted scientific assessments relating to climate change (e.g. the Intergovernmental Panel on Climate Change Third Assessment Report) suggest that the radiative forcing of tropospheric ozone is about 25% that of carbon dioxide. The annual global warming potential of tropospheric ozone is between 918–1022 tons carbon dioxide equivalent/tons tropospheric ozone. This means on a per-molecule basis, ozone in the troposphere has a radiative forcing effect roughly 1,000 times as strong as carbon dioxide. However, tropospheric ozone is a short-lived greenhouse gas, which decays in the atmosphere much more quickly than carbon dioxide. This means that over a 20-year span, the global warming potential of tropospheric ozone is much less, roughly 62 to 69 tons carbon dioxide equivalent / ton tropospheric ozone. Because of its short-lived nature, tropospheric ozone does not have strong global effects, but has very strong radiative forcing effects on regional scales. In fact, there are regions of the world where tropospheric ozone has a radiative forcing up to 150% of carbon dioxide. Ozone precursors are a group of pollutants, predominantly those emitted during the combustion of fossil fuels. Ground-level ozone pollution (tropospheric ozone) is created near the Earth's surface by the action of daylight UV rays on these precursors. The ozone at ground level is primarily from fossil fuel precursors, but methane is a natural precursor, and the very low natural background level of ozone at ground level is considered safe. This section examines the health impacts of fossil fuel burning, which raises ground level ozone far above background levels. There is a great deal of evidence to show that ground-level ozone can harm lung function and irritate the respiratory system. Exposure to ozone (and the pollutants that produce it) is linked to premature death, asthma, bronchitis, heart attack, and other cardiopulmonary problems. Long-term exposure to ozone has been shown to increase risk of death from respiratory illness. A study of 450,000 people living in United States cities saw a significant correlation between ozone levels and respiratory illness over the 18-year follow-up period. The study revealed that people living in cities with high ozone levels, such as Houston or Los Angeles, had an over 30% increased risk of dying from lung disease. Air quality guidelines such as those from the World Health Organization, the United States Environmental Protection Agency (EPA) and the European Union are based on detailed studies designed to identify the levels that can cause measurable ill health effects. According to scientists with the US EPA, susceptible people can be adversely affected by ozone levels as low as 40 nmol/mol. In the EU, the current target value for ozone concentrations is 120 µg/m3 which is about 60 nmol/mol. This target applies to all member states in accordance with Directive 2008/50/EC. Ozone concentration is measured as a maximum daily mean of 8 hour averages and the target should not be exceeded on more than 25 calendar days per year, starting from January 2010. Whilst the directive requires in the future a strict compliance with 120 µg/m3 limit (i.e. mean ozone concentration not to be exceeded on any day of the year), there is no date set for this requirement and this is treated as a long-term objective. In the USA, the Clean Air Act directs the EPA to set National Ambient Air Quality Standards for several pollutants, including ground-level ozone, and counties out of compliance with these standards are required to take steps to reduce their levels. In May 2008, under a court order, the EPA lowered its ozone standard from 80 nmol/mol to 75 nmol/mol. The move proved controversial, since the Agency's own scientists and advisory board had recommended lowering the standard to 60 nmol/mol. Many public health and environmental groups also supported the 60 nmol/mol standard, and the World Health Organization recommends 51 nmol/mol. On October 26, 2015, the EPA published a final rule with an effective date of December 28, 2015 that revised the 8-hour primary NAAQS from 0.075 ppm to 0.070 ppm. The EPA has developed an Air Quality Index (AQI) to help explain air pollution levels to the general public. Under the current standards, eight-hour average ozone mole fractions of 85 to 104 nmol/mol are described as "unhealthy for sensitive groups", 105 nmol/mol to 124 nmol/mol as "unhealthy", and 125 nmol/mol to 404 nmol/mol as "very unhealthy". Ozone can also be present in indoor air pollution, partly as a result of electronic equipment such as photocopiers. A connection has also been known to exist between the increased pollen, fungal spores, and ozone caused by thunderstorms and hospital admissions of asthma sufferers. In the Victorian era, one British folk myth held that the smell of the sea was caused by ozone. In fact, the characteristic "smell of the sea" is caused by dimethyl sulfide, a chemical generated by phytoplankton. Victorian British folk considered the resulting smell "bracing". Ozone production rises during heat waves, because plants absorb less ozone. It is estimated that curtailed ozone absorption by plants was responsible for the loss of 460 lives in the UK in the hot summer of 2006. A similar investigation to assess the joint effects of ozone and heat during the European heat waves in 2003, concluded that these appear to be additive. Ozone, along with reactive forms of oxygen such as superoxide, singlet oxygen, hydrogen peroxide, and hypochlorite ions, is produced by white blood cells and other biological systems (such as the roots of marigolds) as a means of destroying foreign bodies. Ozone reacts directly with organic double bonds. Also, when ozone breaks down to dioxygen it gives rise to oxygen free radicals, which are highly reactive and capable of damaging many organic molecules. Moreover, it is believed that the powerful oxidizing properties of ozone may be a contributing factor of inflammation. The cause-and-effect relationship of how the ozone is created in the body and what it does is still under consideration and still subject to various interpretations, since other body chemical processes can trigger some of the same reactions. A team headed by Paul Wentworth Jr. of the Department of Chemistry at the Scripps Research Institute has shown evidence linking the antibody-catalyzed water-oxidation pathway of the human immune response to the production of ozone. In this system, ozone is produced by antibody-catalyzed production of trioxidane from water and neutrophil-produced singlet oxygen. When inhaled, ozone reacts with compounds lining the lungs to form specific, cholesterol-derived metabolites that are thought to facilitate the build-up and pathogenesis of atherosclerotic plaques (a form of heart disease). These metabolites have been confirmed as naturally occurring in human atherosclerotic arteries and are categorized into a class of secosterols termed atheronals, generated by ozonolysis of cholesterol's double bond to form a 5,6 secosterol as well as a secondary condensation product via aldolization. Ozone has been implicated to have an adverse effect on plant growth: "... ozone reduced total chlorophylls, carotenoid and carbohydrate concentration, and increased 1-aminocyclopropane-1-carboxylic acid (ACC) content and ethylene production. In treated plants, the ascorbate leaf pool was decreased, while lipid peroxidation and solute leakage were significantly higher than in ozone-free controls. The data indicated that ozone triggered protective mechanisms against oxidative stress in citrus." "Even very low concentrations of ozone can be harmful to the upper respiratory tract and the lungs. The severity of injury depends on both by the concentration of ozone and the duration of exposure. Severe and permanent lung injury or death could result from even a very short-term exposure to relatively low concentrations." To protect workers potentially exposed to ozone, U.S. Occupational Safety and Health Administration has established a permissible exposure limit (PEL) of 0.1 μmol/mol (29 CFR 1910.1000 table Z-1), calculated as an 8-hour time weighted average. Higher concentrations are especially hazardous and NIOSH has established an Immediately Dangerous to Life and Health Limit (IDLH) of 5 μmol/mol. Work environments where ozone is used or where it is likely to be produced should have adequate ventilation and it is prudent to have a monitor for ozone that will alarm if the concentration exceeds the OSHA PEL. Continuous monitors for ozone are available from several suppliers. Elevated ozone exposure can occur on passenger aircraft, with levels depending on altitude and atmospheric turbulence. United States Federal Aviation Authority regulations set a limit of 250 nmol/mol with a maximum four-hour average of 100 nmol/mol. Some planes are equipped with ozone converters in the ventilation system to reduce passenger exposure. Ozone generators are used to produce ozone for cleaning air or removing smoke odours in unoccupied rooms. These ozone generators can produce over 3 g of ozone per hour. Ozone often forms in nature under conditions where O2 will not react. Ozone used in industry is measured in μmol/mol (ppm, parts per million), nmol/mol (ppb, parts per billion), μg/m3, mg/h (milligrams per hour) or weight percent. The regime of applied concentrations ranges from 1% to 5% (in air) and from 6% to 14% (in oxygen) for older generation methods. New electrolytic methods can achieve up 20% to 30% dissolved ozone concentrations in output water. Temperature and humidity play a large role in how much ozone is being produced using traditional generation methods (such as corona discharge and ultraviolet light). Old generation methods will produce less than 50% of nominal capacity if operated with humid ambient air, as opposed to very dry air. New generators, using electrolytic methods, can achieve higher purity and dissolution through using water molecules as the source of ozone production. This is the most common type of ozone generator for most industrial and personal uses. While variations of the "hot spark" coronal discharge method of ozone production exist, including medical grade and industrial grade ozone generators, these units usually work by means of a corona discharge tube. They are typically cost-effective and do not require an oxygen source other than the ambient air to produce ozone concentrations of 3–6%. Fluctuations in ambient air, due to weather or other environmental conditions, cause variability in ozone production. However, they also produce nitrogen oxides as a by-product. Use of an air dryer can reduce or eliminate nitric acid formation by removing water vapor and increase ozone production. Use of an oxygen concentrator can further increase the ozone production and further reduce the risk of nitric acid formation by removing not only the water vapor, but also the bulk of the nitrogen. UV ozone generators, or vacuum-ultraviolet (VUV) ozone generators, employ a light source that generates a narrow-band ultraviolet light, a subset of that produced by the Sun. The Sun's UV sustains the ozone layer in the stratosphere of Earth. UV ozone generators use ambient air for ozone production, no air prep systems are used (air dryer or oxygen concentrator), therefore these generators tend to be less expensive. However UV ozone generators usually produce ozone with a concentration of about 0.5% or lower which limits the potential ozone production rate. Another disadvantage of this method is that it requires the ambient air (oxygen) to be exposed to the UV source for a longer amount of time, and any gas that is not exposed to the UV source will not be treated. This makes UV generators impractical for use in situations that deal with rapidly moving air or water streams (in-duct air sterilization, for example). Production of ozone is one of the potential dangers of ultraviolet germicidal irradiation. VUV ozone generators are used in swimming pool and spa applications ranging to millions of gallons of water. VUV ozone generators, unlike corona discharge generators, do not produce harmful nitrogen by-products and also unlike corona discharge systems, VUV ozone generators work extremely well in humid air environments. There is also not normally a need for expensive off-gas mechanisms, and no need for air driers or oxygen concentrators which require extra costs and maintenance. In the cold plasma method, pure oxygen gas is exposed to a plasma created by dielectric barrier discharge. The diatomic oxygen is split into single atoms, which then recombine in triplets to form ozone. Cold plasma machines utilize pure oxygen as the input source and produce a maximum concentration of about 5% ozone. They produce far greater quantities of ozone in a given space of time compared to ultraviolet production. However, because cold plasma ozone generators are very expensive, they are found less frequently than the previous two types. The discharges manifest as filamentary transfer of electrons (micro discharges) in a gap between two electrodes. In order to evenly distribute the micro discharges, a dielectric insulator must be used to separate the metallic electrodes and to prevent arcing. Electrolytic ozone generation (EOG) splits water molecules into H2, O2, and O3. In most EOG methods, the hydrogen gas will be removed to leave oxygen and ozone as the only reaction products. Therefore, EOG can achieve higher dissolution in water without other competing gases found in corona discharge method, such as nitrogen gases present in ambient air. This method of generation can achieve concentrations of 20–30% and is independent of air quality because water is used as the source material. Production of ozone electrolytically is typically unfavorable because of the high overpotential required to produce ozone as compared to oxygen. This is why ozone is not produced during typical water electrolysis. However, it is possible to increase the overpotential of oxygen by careful catalyst selection such that ozone is preferentially produced under electrolysis. Catalysts typically chosen for this approach are lead dioxide or boron-doped diamond. Ozone cannot be stored and transported like other industrial gases (because it quickly decays into diatomic oxygen) and must therefore be produced on site. Available ozone generators vary in the arrangement and design of the high-voltage electrodes. At production capacities higher than 20 kg per hour, a gas/water tube heat-exchanger may be utilized as ground electrode and assembled with tubular high-voltage electrodes on the gas-side. The regime of typical gas pressures is around 2 bars (200 kPa) absolute in oxygen and 3 bars (300 kPa) absolute in air. Several megawatts of electrical power may be installed in large facilities, applied as one phase AC current at 50 to 8000 Hz and peak voltages between 3,000 and 20,000 volts. Applied voltage is usually inversely related to the applied frequency. The dominating parameter influencing ozone generation efficiency is the gas temperature, which is controlled by cooling water temperature and/or gas velocity. The cooler the water, the better the ozone synthesis. The lower the gas velocity, the higher the concentration (but the lower the net ozone produced). At typical industrial conditions, almost 90% of the effective power is dissipated as heat and needs to be removed by a sufficient cooling water flow. Because of the high reactivity of ozone, only a few materials may be used like stainless steel (quality 316L), titanium, aluminium (as long as no moisture is present), glass, polytetrafluorethylene, or polyvinylidene fluoride. Viton may be used with the restriction of constant mechanical forces and absence of humidity (humidity limitations apply depending on the formulation). Hypalon may be used with the restriction that no water come in contact with it, except for normal atmospheric levels. Embrittlement or shrinkage is the common mode of failure of elastomers with exposure to ozone. Ozone cracking is the common mode of failure of elastomer seals like O-rings. Silicone rubbers are usually adequate for use as gaskets in ozone concentrations below 1 wt%, such as in equipment for accelerated aging of rubber samples. 3]. Certain electrical equipment generate significant levels of ozone. This is especially true of devices using high voltages, such as ionic air purifiers, laser printers, photocopiers, tasers and arc welders. Electric motors using brushes can generate ozone from repeated sparking inside the unit. Large motors that use brushes, such as those used by elevators or hydraulic pumps, will generate more ozone than smaller motors. Ozone is similarly formed in the Catatumbo lightning storms phenomenon on the Catatumbo River in Venezuela, though ozone's instability makes it dubious that it has any effect on the ozonosphere. It is the world's largest single natural generator of ozone, lending calls for it to be designated a UNESCO World Heritage Site. In the net reaction, three equivalents of water are converted into one equivalent of ozone and three equivalents of hydrogen. Oxygen formation is a competing reaction. It can also be generated by a high voltage arc. In its simplest form, high voltage AC, such as the output of a Neon-sign transformer is connected to two metal rods with the ends placed sufficiently close to each other to allow an arc. The resulting arc will convert atmospheric oxygen to ozone. The largest use of ozone is in the preparation of pharmaceuticals, synthetic lubricants, and many other commercially useful organic compounds, where it is used to sever carbon-carbon bonds. It can also be used for bleaching substances and for killing microorganisms in air and water sources. Many municipal drinking water systems kill bacteria with ozone instead of the more common chlorine. Ozone has a very high oxidation potential. Ozone does not form organochlorine compounds, nor does it remain in the water after treatment. Ozone can form the suspected carcinogen bromate in source water with high bromide concentrations. The U.S. Safe Drinking Water Act mandates that these systems introduce an amount of chlorine to maintain a minimum of 0.2 μmol/mol residual free chlorine in the pipes, based on results of regular testing. Where electrical power is abundant, ozone is a cost-effective method of treating water, since it is produced on demand and does not require transportation and storage of hazardous chemicals. Once it has decayed, it leaves no taste or odour in drinking water. Although low levels of ozone have been advertised to be of some disinfectant use in residential homes, the concentration of ozone in dry air required to have a rapid, substantial effect on airborne pathogens exceeds safe levels recommended by the U.S. Occupational Safety and Health Administration and Environmental Protection Agency. Humidity control can vastly improve both the killing power of the ozone and the rate at which it decays back to oxygen (more humidity allows more effectiveness). Spore forms of most pathogens are very tolerant of atmospheric ozone in concentrations at which asthma patients start to have issues. Eradicate water borne parasites such as Giardia lamblia and Cryptosporidium in surface water treatment plants. Ozone is a reagent in many organic reactions in the laboratory and in industry. Ozonolysis is the cleavage of an alkene to carbonyl compounds. Many hospitals around the world use large ozone generators to decontaminate operating rooms between surgeries. The rooms are cleaned and then sealed airtight before being filled with ozone which effectively kills or neutralizes all remaining bacteria. Ozone is used as an alternative to chlorine or chlorine dioxide in the bleaching of wood pulp. It is often used in conjunction with oxygen and hydrogen peroxide to eliminate the need for chlorine-containing compounds in the manufacture of high-quality, white paper. Ozone can be used to detoxify cyanide wastes (for example from gold and silver mining) by oxidising cyanide to cyanate and eventually to carbon dioxide. Devices generating high levels of ozone, some of which use ionization, are used to sanitize and deodorize uninhabited buildings, rooms, ductwork, woodsheds, boats and other vehicles. In the U.S., air purifiers emitting low levels of ozone have been sold. This kind of air purifier is sometimes claimed to imitate nature's way of purifying the air without filters and to sanitize both it and household surfaces. The United States Environmental Protection Agency (EPA) has declared that there is "evidence to show that at concentrations that do not exceed public health standards, ozone is not effective at removing many odor-causing chemicals" or "viruses, bacteria, mold, or other biological pollutants". Furthermore, its report states that "results of some controlled studies show that concentrations of ozone considerably higher than these [human safety] standards are possible even when a user follows the manufacturer’s operating instructions". Ozonated water is used to launder clothes and to sanitize food, drinking water, and surfaces in the home. According to the U.S. Food and Drug Administration (FDA), it is "amending the food additive regulations to provide for the safe use of ozone in gaseous and aqueous phases as an antimicrobial agent on food, including meat and poultry." Studies at California Polytechnic University demonstrated that 0.3 μmol/mol levels of ozone dissolved in filtered tapwater can produce a reduction of more than 99.99% in such food-borne microorganisms as salmonella, E. coli 0157:H7 and Campylobacter. This quantity is 20,000 times the WHO-recommended limits stated above. Ozone can be used to remove pesticide residues from fruits and vegetables. Ozone is used in homes and hot tubs to kill bacteria in the water and to reduce the amount of chlorine or bromine required by reactivating them to their free state. Since ozone does not remain in the water long enough, ozone by itself is ineffective at preventing cross-contamination among bathers and must be used in conjunction with halogens. Gaseous ozone created by ultraviolet light or by corona discharge is injected into the water. Ozone is also widely used in treatment of water in aquariums and fish ponds. Its use can minimize bacterial growth, control parasites, eliminate transmission of some diseases, and reduce or eliminate "yellowing" of the water. Ozone must not come in contact with fish's gill structures. Natural salt water (with life forms) provides enough "instantaneous demand" that controlled amounts of ozone activate bromide ion to hypobromous acid, and the ozone entirely decays in a few seconds to minutes. If oxygen fed ozone is used, the water will be higher in dissolved oxygen, fish's gill structures will atrophy and they will become dependent on higher dissolved oxygen levels. 2). Despite these apparent positive effects, ozone use in recirculation systems has been linked to reducing the level of bioavailable iodine in salt water systems, resulting in iodine deficiency symptoms such as goitre and decreased growth in Senegalese sole (Solea senegalensis) larvae. Ozonate seawater is used for surface disinfection of haddock and Atlantic halibut eggs against nodavirus. Nodavirus is a lethal and vertically transmitted virus which causes severe mortality in fish. Haddock eggs should not be treated with high ozone level as eggs so treated did not hatch and died after 3–4 days. Ozone application on freshly cut pineapple and banana shows increase in flavonoids and total phenol contents when exposure is up to 20 minutes. Decrease in ascorbic acid (one form of vitamin C) content is observed but the positive effect on total phenol content and flavonoids can overcome the negative effect. Tomatoes upon treatment with ozone shows an increase in β-carotene, lutein and lycopene. However, ozone application on strawberries in pre-harvest period shows decrease in ascorbic acid content. Ozone facilitates the extraction of some heavy metals from soil using EDTA. EDTA forms strong, water-soluble coordination compounds with some heavy metals (Pb, Zn) thereby making it possible to dissolve them out from contaminated soil. If contaminated soil is pre-treated with ozone, the extraction efficacy of Pb, Am and Pu increases by 11.0–28.9%, 43.5% and 50.7% respectively. Various therapeutic uses for ozone have been proposed, but are not supported by high quality evidence and generally considered alternative medicine. Ozone depletion, including the phenomenon known as the ozone hole. ↑ This vapor pressure is for the critical temperature, which is below room temperature. 1 2 3 4 5 "NIOSH Pocket Guide to Chemical Hazards #0476". National Institute for Occupational Safety and Health (NIOSH). ↑ Cuthbertson, Clive; Cuthbertson, Maude (1914). "On the Refraction and Dispersion of the Halogens, Halogen Acids, Ozone, Steam Oxides of Nitrogen, and Ammonia". Philosophical Transactions of the Royal Society A. 213 (497–508): 1–26. Bibcode:1914RSPTA.213....1C. doi:10.1098/rsta.1914.0001. Retrieved 4 February 2016. ↑ "Ozone". Immediately Dangerous to Life and Health Concentrations (IDLH). National Institute for Occupational Safety and Health (NIOSH). ↑ Streng, A. G. (1961). "Tables of Ozone Properties". Journal of Chemical Engineering Data. 6 (3): 431–436. doi:10.1021/je00103a031. 1 2 "Precursor Era Contributors to Meteorology". colostate.edu. 1 2 Rubin, Mordecai B. (2001). 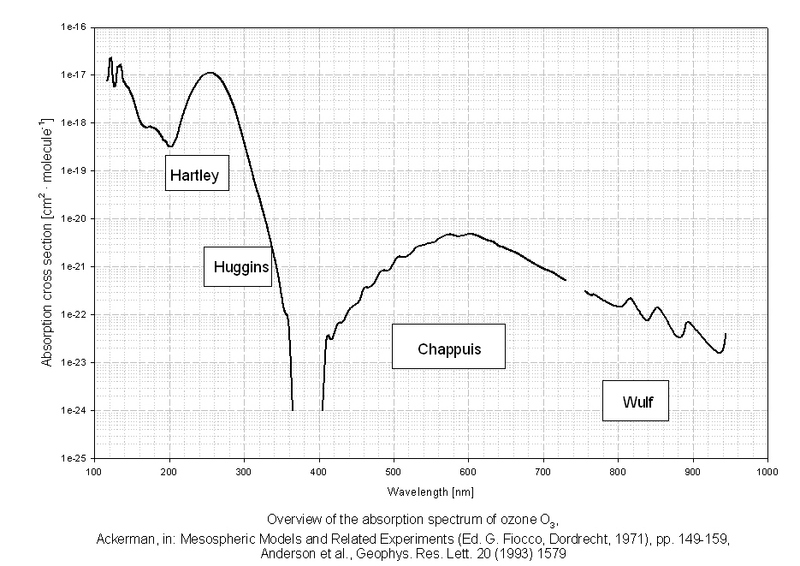 "The History of Ozone: The Schönbein Period, 1839–1868" (PDF). Bull. Hist. Chem. 26 (1): 40–56. ↑ "Today in Science History". Retrieved 2006-05-10. 1 2 3 4 Jacewicz, Natalie (2017). "A Killer of a Cure". Distillations. 3 (1): 34–37. Retrieved April 13, 2018. ↑ Le Prestre, Philippe G., ed. (1998). Protecting the ozone layer : lessons, models, and prospects ; [product of the Tenth Anniversary Colloquium of the Montreal Protocol, held on September 13, 1997 ; part of a series of events held in Montreal to mark the tenth anniversary of the signing of the Montreal Protocol on Substances that Deplete the Ozone Layer, September 16, 1987]. Boston: Kluwer. p. 2. ISBN 9780792382454. ↑ Schönbein, Christian Friedrich (1840). "Research on the nature of the odour in certain chemical reactions". Letter to the Académie des Sciences in Paris. ↑ Jacques-Louis Soret (1865). "Recherches sur la densité de l'ozone". Comptes rendus de l'Académie des sciences. 61: 941. ↑ "Ozone FAQ". Global Change Master Directory. Archived from the original on 2006-06-01. Retrieved 2006-05-10. ↑ Henry Henshaw to William Brewster, July 2, 1902, Harvard Museum of Comparative Zoology Archives. ↑ "The science behind that fresh seaside smell". Retrieved 2016-03-17. ↑ Anstie, Francis (1874). "Clinic of the Month: Dr. McKendrick on Ozone". The Practitioner: A Journal of Therapeutics and Public Health. 12 (January–June): 123. ↑ Rubin, Mordecai B. (2001). "THE HISTORY OF OZONE. THE SCHÖNBEIN PERIOD, 1839–1868" (PDF). Bulletin of the History of Chemistry. 26 (1): 48. Retrieved 13 April 2018. ↑ Hill, L.; Flack, M. (28 December 1911). "The Physiological Influence of Ozone". Proceedings of the Royal Society B: Biological Sciences. 84 (573): 404–415. doi:10.1098/rspb.1911.0086. Retrieved 13 April 2018. ↑ Stoker, George (1916). "The Surgical Uses of Ozone". Lancet. 188 (4860): 712. doi:10.1016/S0140-6736(01)31717-8. ↑ "Oxygen". WebElements. Retrieved 2006-09-23. 1 2 3 4 5 Brown, Theodore L.; LeMay, H. Eugene, Jr.; Bursten, Bruce E.; Burdge, Julia R. (2003) . "22". In Nicole Folchetti. Chemistry: The Central Science (9th ed.). Pearson Education. pp. 882–883. ISBN 978-0-13-066997-1. ↑ Tanaka, Takehiko; Morino, Yonezo (1970). "Coriolis interaction and anharmonic potential function of ozone from the microwave spectra in the excited vibrational states". Journal of Molecular Spectroscopy. 33 (3): 538–551. Bibcode:1970JMoSp..33..538T. doi:10.1016/0022-2852(70)90148-7. ↑ Mack, Kenneth M.; Muenter, J. S. (1977). "Stark and Zeeman properties of ozone from molecular beam spectroscopy". Journal of Chemical Physics. 66 (12): 5278–5283. Bibcode:1977JChPh..66.5278M. doi:10.1063/1.433909. ↑ – Earth Science FAQ: Where can I find information about the ozone hole and ozone depletion? Archived 2006-06-01 at the Wayback Machine. Goddard Space Flight Center, National Aeronautics and Space Administration, March 2008. ↑ Koike, K; Nifuku, M; Izumi, K; Nakamura, S; Fujiwara, S; Horiguchi, S (2005). "Explosion properties of highly concentrated ozone gas" (PDF). Journal of Loss Prevention in the Process Industries. 18 (4–6): 465. doi:10.1016/j.jlp.2005.07.020. Archived from the original (PDF) on 2009-03-27. ↑ Harris, Daniel (2007). Quantitative Chemical Analysis. Freeman. p. 279. ↑ Bailey, P. S. (1982). "Chapter 2". Ozonation in Organic Chemistry. 2. New York, NY: Academic Press. ISBN 978-0-12-073102-2. ↑ Solomons, T.W. Graham & Fryhle, Craig B. (2008). "Chapter 8 Alkenes and Alkynes – Part II: Addition Reactions and Synthesis". Organic Chemistry, 9th Edition. Wiley. p. 344. ISBN 978-0-470-16982-7. 1 2 Horvath M.; Bilitzky L.; Huttner J. (1985). Ozone. Elsevier. pp. 44–49. ISBN 978-0-444-99625-1. ↑ Housecroft, C. E.; Sharpe, A. G. (2004). Inorganic Chemistry (2nd ed.). Prentice Hall. p. 439. ISBN 978-0130399137. ↑ Housecroft, C. E.; Sharpe, A. G. (2004). Inorganic Chemistry (2nd ed.). Prentice Hall. p. 265. ISBN 978-0130399137. ↑ Horvath M.; Bilitzky L.; Huttner J. (1985). Ozone. Elsevier. pp. 259, 269–270. ISBN 978-0-444-99625-1. ↑ Shimanouchi, T. "Tables of Molecular Vibrational Frequencies" (PDF). ↑ World Meteorological Organization. "Chapter 16: Measurement of Ozone" (PDF). ↑ Max Planck Institute – Mainz. "The MPI-Mainz UV/VIS Spectral Atlas of Gaseous Molecules of Atmospheric Interest". ↑ "Measured Ozone Depletion". Ozone-Information.com. Archived from the original on 2013-09-14. Retrieved 2014-01-22. ↑ Keller-Rudek, Hannelore. 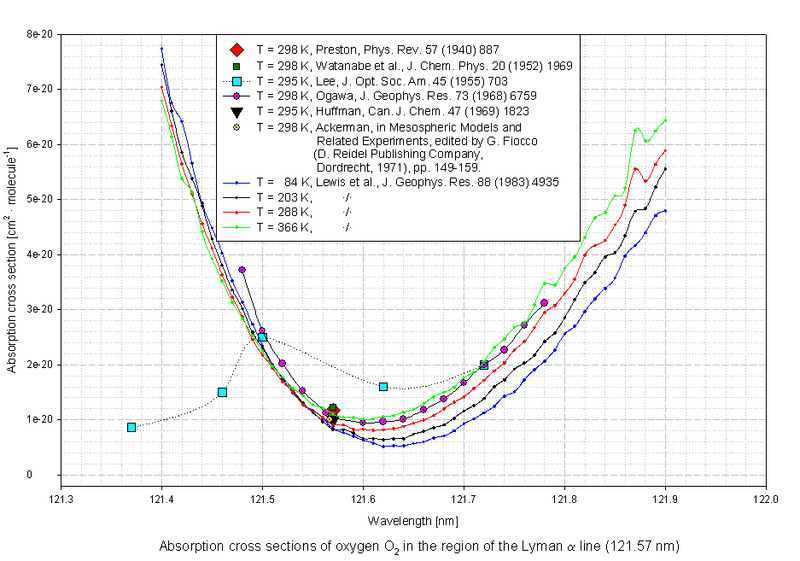 "The MPI-Mainz UV/VIS Spectral Atlas of Gaseous Molecules of Atmospheric Interest: O2, Lyman-alpha". Archived from the original on 2015-11-17. ↑ Matsumi, Yutaka; Kawasaki, Masahiro (2003). "Photolysis of Atmospheric Ozone in the Ultraviolet Region". Chemical Reviews. 103 (12): 4767–82. doi:10.1021/cr0205255. PMID 14664632. See the graphical absorption of ozone in two of its absorption bands, as a function of wavelength. ↑ Stevenson; et al. (2006). "Multimodel ensemble simulations of present-day and near-future tropospheric ozone". American Geophysical Union. Retrieved 2006-09-16. ↑ "Rising Ozone Levels Pose Challenge to U.S. Soybean Production, Scientists Say". NASA Earth Observatory. 2003-07-31. Retrieved 2006-05-10. 1 2 Mutters, Randall (March 1999). "Statewide Potential Crop Yield Losses From Ozone Exposure". California Air Resources Board. Archived from the original on 2004-02-17. Retrieved 2006-05-10. ↑ "Tropospheric Ozone in EU – The consolidated report". European Environmental Agency. 1998. Retrieved 2006-05-10. ↑ "Atmospheric Chemistry and Greenhouse Gases". Intergovernmental Panel on Climate Change. Archived from the original on 2006-07-10. Retrieved 2006-05-10. ↑ "Climate Change 2001". Intergovernmental Panel on Climate Change. 2001. Archived from the original on 2006-09-13. Retrieved 2006-09-12. ↑ Life Cycle Assessment Methodology Sufficient to Support Public Declarations and Claims, Committee Draft Standard, Version 2.1. Scientific Certification Systems, February 2011. Annex B, Section 4. ↑ NASA GODDARD HOMEPAGE FOR TROPOSPHERIC OZONE NASA Goddard Space Flight Center Code 613.3, Chemistry and Dynamics Branch. Acdb-ext.gsfc.nasa.gov (2006-09-20). Retrieved on 2012-02-01. ↑ Jeannie Allen (2003-08-22). "Watching Our Ozone Weather". NASA Earth Observatory. Retrieved 2008-10-11. ↑ EPA Course Developers. "Health Effects of Ozone in the General Population". EPA. 1 2 3 Weinhold B (2008). "Ozone nation: EPA standard panned by the people". Environ. Health Perspect. 116 (7): A302–A305. doi:10.1289/ehp.116-a302. PMC 2453178. PMID 18629332. ↑ Jerrett, Michael; Burnett, Richard T.; Pope, C. Arden, III; Ito, Kazuhiko; Thurston, George; Krewski, Daniel; Shi, Yuanli; Calle, Eugenia; Thun, Michael (March 12, 2009). "Long-Term Ozone Exposure and Mortality". N. Engl. J. Med. 360 (11): 1085–1095. doi:10.1056/NEJMoa0803894. PMC 4105969. PMID 19279340. ↑ Wilson, Elizabeth K. (March 16, 2009). "Ozone's Health Impact". Chemical & Engineering News. 87 (11): 9. doi:10.1021/cen-v087n011.p009a. ↑ Dahl, R (2006). "Ozone Overload: Current Standards May Not Protect Health". Environ. Health Perspect. 114 (4): A240. doi:10.1289/ehp.114-a240a. PMC 1440818. ↑ Bell, ML; Peng, RD; Dominici, F (2006). "The exposure-response curve for ozone and risk of mortality and the adequacy of current ozone regulations". Environ. Health Perspect. 114 (4): 532–6. doi:10.1289/ehp.8816. PMC 1440776. PMID 16581541. ↑ Directive 2008/50/EC. Eur-lex.europa.eu. Retrieved on 2013-01-17. ↑ "DIRECTIVE 2008/50/EC on ambient air quality and cleaner air for Europe". EC. 2008-06-11. Retrieved 2010-08-23. ↑ "Comments of the American Lung Association, Environmental Defense, Sierra Club on the U.S. Environmental Protection Agency's Proposed Revisions to the National Ambient Air Quality Standards for Ozone July 11, 2007 – 72 FR 37818" (PDF). Lungusa.org. Archived from the original (PDF) on July 10, 2010. ↑ "Federal Register | National Ambient Air Quality Standards for Ozone". www.federalregister.gov. Retrieved 2016-05-16. ↑ Anderson, W.; G.J. Prescott; S. Packham; J. Mullins; M. Brookes; A. Seaton (2001). "Asthma admissions and thunderstorms: a study of pollen, fungal spores, rainfall, and ozone". QJM: an International Journal of Medicine. 94 (8): 429–433. doi:10.1093/qjmed/94.8.429. PMID 11493720. ↑ "It's not just the heat – it's the ozone: Study highlights hidden dangers". University of York. Retrieved January 14, 2014. ↑ Kosatsky T. (July 2005). "The 2003 European heat waves". Eurosurveillance. 10 (7). Retrieved January 14, 2014. ↑ Hoffmann, Roald (January 2004). "The Story of O". American Scientist. 92 (1): 23. doi:10.1511/2004.1.23. Archived from the original on 2006-09-25. Retrieved 2006-10-11. ↑ Smith, LL (2004). "Oxygen, oxysterols, ouabain, and ozone: a cautionary tale". Free Radical Biology & Medicine. 37 (3): 318–24. doi:10.1016/j.freeradbiomed.2004.04.024. PMID 15223065. ↑ Paul Wentworth; Nieva, J; Takeuchi, C; Galve, R; Wentworth, AD; Dilley, RB; Delaria, GA; Saven, A; et al. (2003). "Evidence for Ozone Formation in Human Atherosclerotic Arteries". Science. 302 (5647): 1053–6. Bibcode:2003Sci...302.1053W. doi:10.1126/science.1089525. PMID 14605372. ↑ Iglesias, Domingo J.; Ángeles Calatayuda; Eva Barrenob; Eduardo Primo-Milloa; Manuel Talon (2006). "Responses of citrus plants to ozone: leaf biochemistry, antioxidant mechanisms and lipid peroxidation". Plant Physiology and Biochemistry. 44 (2–3): 125–131. doi:10.1016/j.plaphy.2006.03.007. PMID 16644230. 1 2 Lai, Jennifer. (2008-05-08) Airplane Air Heavy On The Ozone – Daily Brief. Portfolio.com. Retrieved on 2012-02-01. ↑ Air Quality In Airplanes: Blame Ozone And Natural Oils On Skin. Sciencedaily.com (2007-09-05). Retrieved on 2012-02-01. ↑ Dohan, J. M.; W. J. Masschelein (1987). "Photochemical Generation of Ozone: Present State-of-the-Art". Ozone Sci. Eng. 9 (4): 315–334. doi:10.1080/01919518708552147. ↑ Foller, Peter C.; Tobias, Charles W. (1982). "The Anodic Evolution of Ozone". Journal of the Electrochemical Society. 129 (3): 506. doi:10.1149/1.2123890. ↑ Arihara, Kazuki; Terashima, Chiaki; Fujishimam Akira (2007). "Electrochemical Production of High-Concentration Ozone-Water Using Freestanding Perforated Diamond Electrodes". Journal of the Electrochemical Society. 154 (4): E71. doi:10.1149/1.2509385. ↑ "Lab Note #106 Environmental Impact of Arc Suppression". Arc Suppression Technologies. April 2011. Retrieved October 10, 2011. ↑ ¿Relámpagos del Catatumbo regeneran la capa de ozono?. Agencia de noticias de la Universidad del Zulia. ↑ "Fire in the Sky". Archived from the original on 2011-07-21. Retrieved 2008-08-16. ↑ Ibanez, Jorge G.; Rodrigo Mayen-Mondragon; M. T. Moran-Moran (2005). "Laboratory Experiments on the Electrochemical Remediation of the Environment. Part 7: Microscale Production of Ozone". Journal of Chemical Education. 82 (10): 1546. doi:10.1021/ed082p1546. Retrieved 2006-05-10. ↑ "Ozone and Color Removal". Ozone Information. Retrieved 2009-01-09. ↑ Hoigné, J. (1998). Handbook of Environmental Chemistry, Vol. 5 part C. Berlin: Springer-Verlag. pp. 83–141. ↑ "Oxidation Potential of Ozone". Ozone-Information.com. Archived from the original on 2008-04-19. Retrieved 2008-05-17. ↑ "Decontamination: Ozone scores on spores". Hospital Development. Wilmington Media Ltd. 2007-04-01. Archived from the original on 2007-09-29. Retrieved 2007-05-30. 1 2 3 Montecalvo, Joseph; Doug Williams. "Application of Ozonation in Sanitizing Vegetable Process Washwaters" (PDF). California Polytechnic State University. Archived from the original (PDF) on May 28, 2008. Retrieved 2008-03-24. ↑ Steeves, Susan A. (January 30, 2003). "Ozone may provide environmentally safe protection for grains". Purdue News. ↑ "Chemical Synthesis with Ozone". Ozone-Information.com. Archived from the original on 2008-04-10. Retrieved 2008-05-17. ↑ Pandey, V. C. (2007). Environmental Education. Gyan Publishing House. ISBN 978-81-8205-175-1. ↑ de Boer, Hero E. L.; van Elzelingen-Dekker, Carla M.; van Rheenen-Verberg, Cora M. F.; Spanjaard, Lodewijk (October 2006). "Use of Gaseous Ozone for Eradication of Methicillin-Resistant Staphylococcus aureus From the Home Environment of a Colonized Hospital Employee". Infection Control and Hospital Epidemiology. 27 (10): 1120–1122. doi:10.1086/507966. JSTOR 507966. PMID 17006820. ↑ Sjöström, Eero (1993). Wood Chemistry: Fundamentals and Applications. San Diego, CA: Academic Press, Inc. ISBN 978-0-12-647481-7. ↑ Su, Yu-Chang; Chen, Horng-Tsai (2001). "Enzone Bleaching Sequence and Color Reversion of Ozone-Bleached Pulps". Taiwan Journal of Forest Science. 16 (2): 93–102. ↑ Bollyky, L. J. (1977). Ozone Treatment of Cyanide-Bearing Wastes, EPA Report 600/2-77-104. Research Triangle Park, N.C.: U.S. Environmental Protection Agency. ↑ EPA report on consumer ozone air purifiers. Epa.gov. Retrieved on 2012-02-01. ↑ Tersano Inc (2007). "lotus Sanitises Food without Chemicals". Archived from the original on 2007-02-11. Retrieved 2007-02-11. ↑ Jongen, W (2005). Improving the Safety of Fresh Fruit and Vegetables. Boca Raton: Woodhead Publishing Ltd. ISBN 978-1-85573-956-7. ↑ "Alternative Disinfectants and Oxidant Guidance Manual" (PDF). United States Environmental Protection Agency. April 1999. Retrieved 2008-01-14. ↑ Noble, A.C.; Summerfelt, S.T. (1996). "Diseases encountered in rainbow trout cultured in recirculating systems". Annual Review of Fish Diseases. 6: 65–92. doi:10.1016/S0959-8030(96)90006-X. ↑ Ferreira, O; de Costa, O.T. ; Ferreira, Santos; Mendonca, F. (2004). "Susceptibility of the Amazonian fish, Colossoma macropomum (Serrasalminae), to short-term exposure to nitrite". Aquaculture. 232: 627–636. doi:10.1016/S0044-8486(03)00524-6. ↑ Ribeiro, A.R.A. ; Ribeiro, L.; Saele, Ø.; Hamre, K.; Dinis, M.T. ; Moren, M. (2009). "Iodine-enriched rotifers andArtemiaprevent goitre in Senegalese sole (Solea senegalensis) larvae reared in a recirculation system". Aquaculture Nutrition. 17 (3): 248–257. doi:10.1111/j.1365-2095.2009.00740.x. ↑ Buchan, K.; Martin-Robinchaud, D.; Benfey, T.J.; MacKinnon, A; Boston, L (2006). "The efficacy of ozonated seawater for surface disinfection of haddock (Melanogrammus aeglefinus) eggs against piscine nodavirus". Aquacultural Engineering. 35: 102–107. doi:10.1016/j.aquaeng.2005.10.001. ↑ Alothman, M.; Kaur, B.; Fazilah, A.; Bhat, Rajeev; Karim, Alias A. (2010). "Ozone-induced changes of antioxidant capacity of fresh-cut tropical fruits". Innovative Food Science and Emerging Technologies. 11 (4): 666–671. doi:10.1016/j.ifset.2010.08.008. ↑ Tzortzakis, N.; Borland, A.; Singleton, I.; Barnes, J (2007). "Impact of atmospheric ozone-enrichment on quality-related attributes of tomato fruit". Postharvest Biology and Technology. 45 (3): 317–325. doi:10.1016/j.postharvbio.2007.03.004. ↑ Keutgen, A.J. ; Pawelzik, E. (2008). "Influence of pre-harvest ozone exposure on quality of strawberry fruit under simulated retail conditions". Postharvest Biology and Technology. 49: 10–18. doi:10.1016/j.postharvbio.2007.12.003. ↑ Lestan, D.; Hanc, A.; Finzgar, N. (2005). "Influence of ozonation on extractability of Pb and Zn from contaminated soils". Chemosphere. 61 (7): 1012–1019. Bibcode:2005Chmsp..61.1012L. doi:10.1016/j.chemosphere.2005.03.005. PMID 16257321. 1 2 Plaue, J.W. ; Czerwinski, K.R. (2003). "The influence of ozone on ligand-assisted extraction of 239Pu and 241Am from rocky flats soil". Radiochim. Acta. 91 (6–2003): 309–313. doi:10.1524/ract.91.6.309.20026. Greenwood, Norman N.; Earnshaw, Alan (1997). Chemistry of the Elements (2nd ed.). Butterworth-Heinemann. ISBN 0-08-037941-9. United States. Environmental Protection Agency. Risk and Benefits Group. (August 2014). Health Risk and Exposure Assessment for Ozone: Final Report. Wikimedia Commons has media related to Ozone. Paul Crutzen Interview Freeview video of Paul Crutzen Nobel Laureate for his work on decomposition of ozone talking to Harry Kroto Nobel Laureate by the Vega Science Trust. NASA Study Links "Smog" to Arctic Warming — NASA Goddard Institute for Space Studies (GISS) study shows the warming effect of ozone in the Arctic during winter and spring.